It'll be a hot time in the Old Pueblo tonight (as usual). Prevent dehydration with beverages as refreshing as the summer's first monsoon. 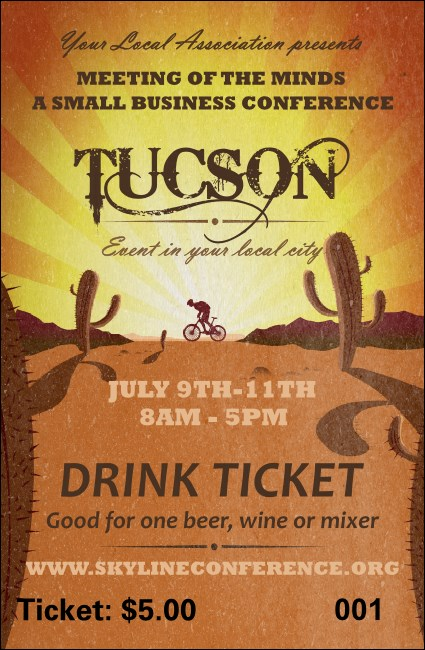 Just sell or distribute these Tucson Drink Tickets and keep your guests from drying out with this image of a dedicated cyclist crossing the Sonoran Desert, silhouetted by the rising sun. Arid event sales? Prepare for a deluge with TicketPrinting.com!